When I look at the average caravan door I am always amazed how flimsy the door lock assembly appears. In most cases I imagine it would be possible to open a door with one hard pull. I am sure this is yet another “trying to keep the weight down” consideration from the manufacturer. Obviously, they would not be trying to reduce their costs!!! However, we really don’t want anyone in our van, not unless we say “Hi, please come inside” just prior to them doing so. We are not housing the Crown Jewels in there, but when you start adding up the various electric gadgets, phones, house keys and car keys, etc, you start to realise ‘one hard pull’ is just too easy. We started to investigate the door security options and initially liked the Folding Grab Handle Lock by Fiamma. 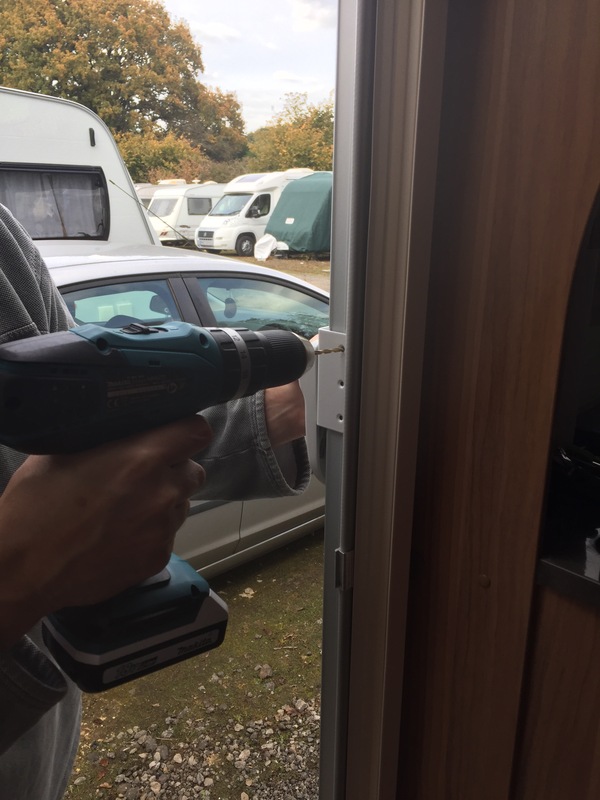 This lock is secured to the caravan by bolting through the caravan body and the grab handle swings over the door and locks into place giving it a dual purpose. 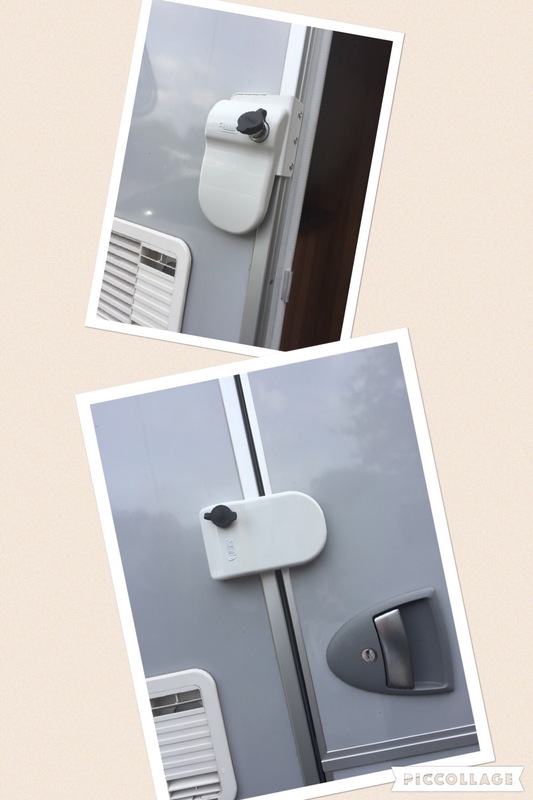 It is worth bearing in mind that the handle could be become a potential lever for a thief and serious attempts at entry could cause damage to the caravan wall, an additional locking plate can be added to the caravan door to prevent this scenario. Ultimately, we did not take this preferred option, as the internal arrangement of our cupboards was in direct line with the bolting points and would have required a bit more meddling, skill and patience than we were gifted with, not to mention the general fear of drilling holes into the caravan wall! 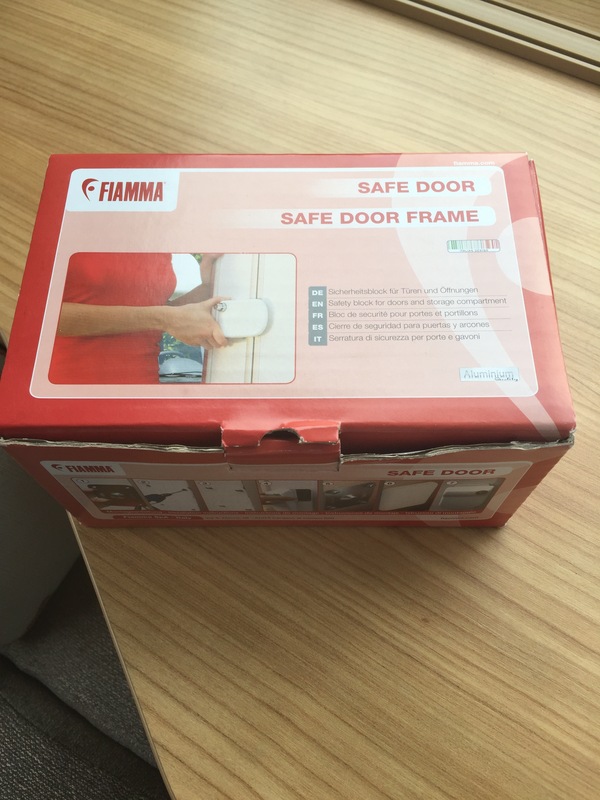 Our compromise was the Fiamma Safe Door Frame Lock. This lock is fitted quite simply to the door frame and does not require any external holes to the body work. We lined up the plate to the frame and drilled the holes in situ, drilling first through thin aluminium door frame then after small cavity drilling partly into second surface to create pilot hole for the three screws. After reading a number of reviews we followed advice and used bigger screws than the ones provided in the box, which frankly, didn’t look up to the job… and that’s it, job done. Do we feel the van is safer now? Yes, but only to a degree, I would say we have moved the door security from 2/10 to 5/10. The preferred lock mentioned above would have scored higher. We now feel an opportunist thief may see this and opt for an easier target, unless of course, they think the extra lock means we are indeed housing the Crown Jewels. As most people will tell you, if someone is hell bent on getting in the van, they will get in. Note to ourselves: We need to remember to flip the locking plate 180 degrees and ‘lock it’ in the open position when inside the caravan. If not, some numpty could move it over the door and the site of my rear reversing out the bedroom window in my ‘jimjams’ could spoil breakfast for the neighbours on site. Now, how to secure those Windows?? ?